Forest Farm is a small wildlife oasis a few miles from Cosmeston that always manages to pack in so much more than I ever believe is possible. 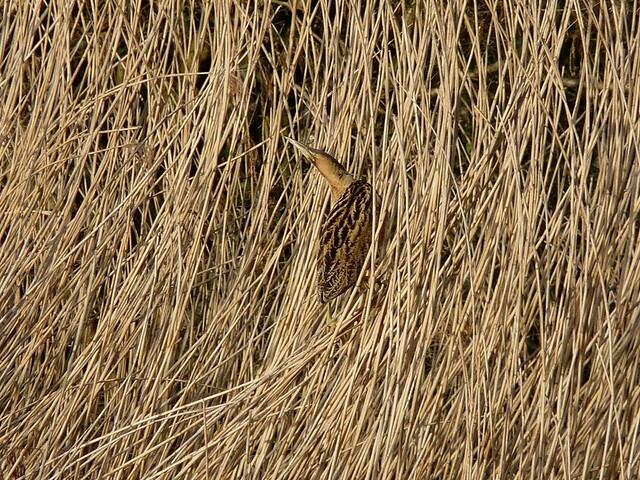 A couple of years ago I saw my first Bittern since childhood there with the added bonus of renowned photographer Andy Rouse also being present. This time our company was not nearly as illustrious but with recent reports of two Bitterns from one of the hides we settled down to wait. For some reason the hope of a Bittern sighting is the only thing that has ever made me willingly sit in the same location for hours on end. 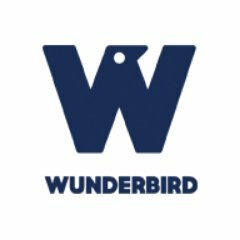 I don't know what it is about them but they seem to build a sense of expectation within me like no other bird or animal has ever been able to do. When one finally appears that expectation is instantly replaced with joy, closely followed by a quick grab for the camera that is invariably switched off (I never learn). This time was to be no different but the means of arrival for the Bittern in question was somewhat unexpected. I'm used to seeing them creep out of the reeds but this individual instead flew in from our left and landed right at the top of the reeds. Its landing was less than graceful as the reeds beneath it started to give way and wings were deployed in a frantic effort to maintain some semblance of balance. 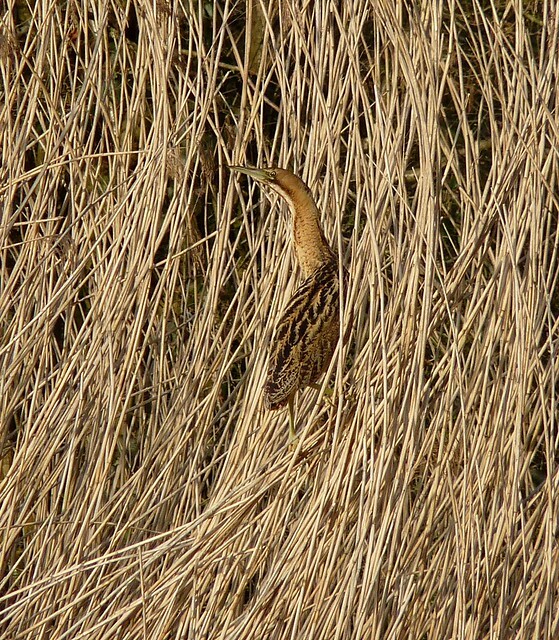 Fortunately an equilibrium between gravity and reed strength was reached and the Bittern lifted its head in triumph. For the next ten minutes it sat there and looked around, no doubt wondering why one of the people outside the hide was using a camera that sounded a lot like a machine gun. 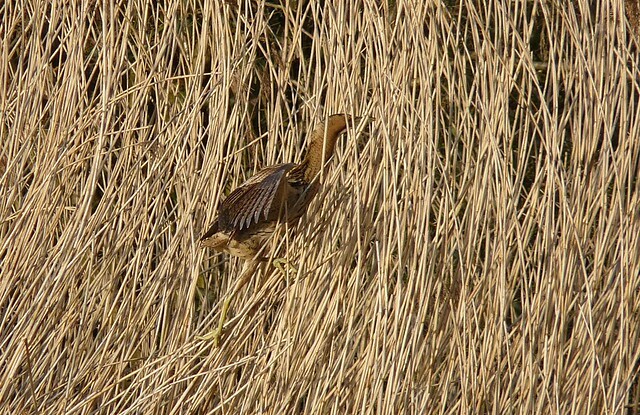 Eventually the Bittern dropped down further into the reeds and out of sight but what an encounter. It was so nice to see one not out on ice for a change as well. During our wait a staggering number of species passed by including my first Stock Dove of the year and great views of a Green Woodpecker climbing up a nearby power pole. A Kingfisher flew past a couple of times and then seemed to be joined by a second bird somewhere behind us. There was obviously an exchange of words as both became quite vocal. Back out in front and two Jays, numerous Reed Buntings, two female Bullfinches and numerous overflying Grey Herons kept us entertained. A Common Snipe was also snoozing on a small island in the middle of the pond but we just missed catching a glimpse of a Water Rail. What a reserve. If you've never been before I highly recommend it. beautiful against the reeds! nice! Cracking Bittern shots, Adam. Looks like you got better views of it than I did! Great shots of the Bittern Adam. Superb captures of a stunning bird. Thanks everyone. Can't believe how lucky I've been with Bittern's over the last couple of years.